Students learn to code by playing a video game. 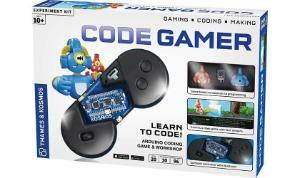 Use sensors to control the game with this innovative gamepad. Solve puzzles and challenges in the game to learn the Arduino programming language. Write your own programs and develop new applications for the sensors. Connect the physical and digital worlds. Use the gamepad to play through 15 fun game levels on your tablet. Plug one of the four sensorbots into the gamepad to activate its powers. The sensorbot named Kelvin melts ice blocks when you warm its temperature sensor with your hand. The Decibels sensorbot will assist you if you trigger its sound sensor with noise. Lumen reveals things hidden in dark spaces when you shine light on its light sensor. Newton will force its way through obstacles in your path if you shake the touch sensor. Design and create your own game levels, share them, and access other players’ levels. Use the light sensor to count how many times a drawer is opened or program an alarm system that sends you messages. Ordering information: This kit includes an Arduino-compatible microcontroller (with Bluetooth), cable, rotary control wheel, circuit board, gamepad housing, two push buttons, motion sensor, temperature sensor, sound sensor, light sensor, parts for projects, and CodeGamer App. It requires a tablet or Smartphone running iOS or Android.